What do you do? I am the new general manager for Walsh Construction Co. We are a general contractor specializing in building affordable housing, student housing, senior housing and mixed-use buildings in and around Seattle. How did you get started in your field? As a kid, I was always building things like tree houses, snow forts and Lego structures. I went to college to study architecture and volunteered with my campus chapter of Habitat for Humanity, where I helped build a complete house from start to finish. 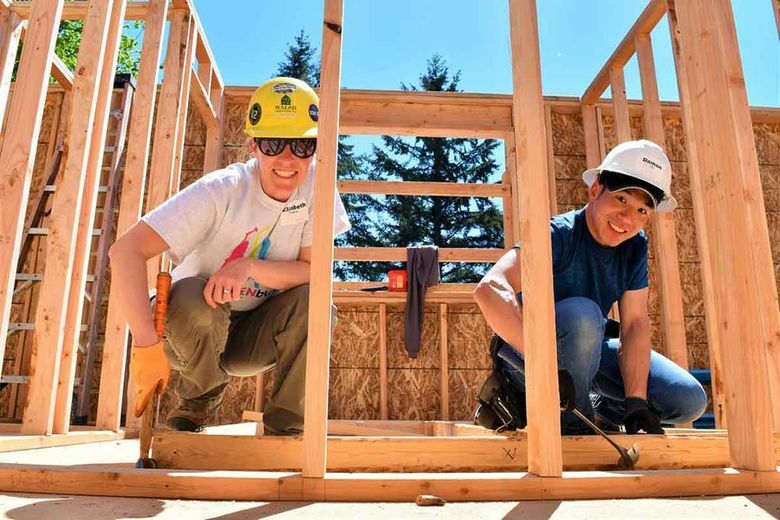 After college, I joined AmeriCorps, which allowed me to spend two years working for Habitat for Humanity of East King County leading teams of volunteers and future homeowners in construction. That experience solidified my passion for building affordable housing, which I’ve been doing with Walsh for the last 14 years. What’s a typical day like? Every day is different, which is part of the fun of working in construction. As general manager, I spend a lot of time reviewing building plans and visiting sites or meeting with clients to evaluate potential projects. A lot of my day revolves around communicating and interacting with the project teams that are working on our current developments. What’s the best part of the job? The best part of my job is seeing the tangible results of our projects around Seattle. It is gratifying to see buildings I’ve worked on being lived in and appreciated. I also love interacting with all the wonderful people who work at Walsh and with our project partners. There are a lot of headlines about affordable housing in the news, but you don’t often hear about the smart, compassionate people who are working behind the scenes to make a difference. What’s something “cool” that happens at work? One of my favorite things is seeing a team of diverse people come together to create something out of nothing. There’s an incredible amount of skill, craft and problem-solving each trade brings to the project and it takes all of them to get the project built. Construction is a very interesting and rewarding way to spend your working life. Working in the construction industry is a fulfilling career because it’s always challenging, you’re always learning and if you’re lucky, you get to see how the finished project benefits the community. What surprises people about your job? Many people are surprised to hear I work in construction. As a woman and a mom, it’s possible I don’t fit their image of what a construction worker looks like. As the first woman to serve as general manager at Walsh, I’m proud to work at a construction company with so many other strong and talented women. Of our 121 non-trade employees throughout Washington, women make up 40 percent of department heads and project managers and 29 percent of our total workforce. We are continually recruiting talented women and men of diverse backgrounds and experience who bring their technical skills, enthusiasm and collaborative spirit to the task of building value for our clients and community.